Charles Manson Beatty was the first child born to William Able Beatty and Isabella McCorkle. Charles was born 08 Aug 1795 in North Carolina. Charles married Judith Sherrill on 12 Oct 1801 in Lincoln County, NC. Judith was the daughter of Nicholas Osborne Sherrill and Martha Dillon and was born 12 Oct 1801. Charles and Judith had twelve children. Charles Beaty/Beatty is listed in the 1840 Lincoln County Census. Catawba County was not established until 1942. There were 14 people living on the family farm - 3 adults and 11 children. The 1850 Catawba County Census lists the names and ages of everyone living on Charles & Judith's farm which was valued at about $1200. Eight of the children were still living there. Judith " 48 F "
Gilbert " 21 M Farmer "
Lovenia " 19 F "
Judith died 04 Jan 1858. 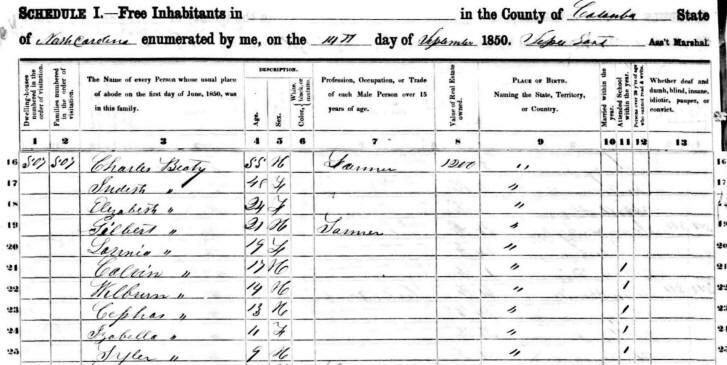 The 1860 Catawba County Census shows that only Charles and three of his children were still living on the family farm. The value of the farm had risen to an impressive $12,500 with a $3000 personal estate. Lavina " 26 F "
Tyler " 20 M Farm Laborer "
Tyler, age 21, enlisted in the Civil War on 06 Jun 1861 as part of Company F, 23rd Regiment. He was taken prisoner at Gettysburg and released at the end of the war. Charles Manson Beatty died 23 Dec 1863. He and Judith are buried in the Sherrill Family Cemetery on Island Point Rd. in Sherrills Ford, NC. If you have additional photos or information on Charles Manson Beatty, please contact me.